Metal wins here, according to Thumb and Hammer. It’s lighter than wood and takes up half the space of lumber because of its hollowed shape. This makes for easier transporting and storage. Cut metal studs with aviation snips, which means no sawdust. Wear gloves, though, to protect the hands from sharp edges, and clean up any small pieces that end up on the floor. Steel framing is easier to handle because the studs weigh a third less than wood and can be installed at 24 inches on center. They also are attached with screws, so moving studs is simple if you make a mistake. Wood is prone to twisting and warping; metal is not. Wood also wicks moisture, which can lead to mold growth and rot, while metal is immune. Metal does rust, so install a vapor barrier or sill gasket between the bottom plate and the concrete floor. The strength and ductility of structural cold-formed steel (CFS) framing, along with the holding power of CFS connections, make it ideal for construction in high-wind and seismic zones such as the U. S. eastern seaboard, the Gulf Coast states, California and Hawaii. Carpenter ants and termites can severely damage wood construction, but steer clear of metal. Likewise, wood burns and metal does not. A wall built with metal studs is virtually fireproof. There are some nuances to this area. Steel framing can cost three to 15 percent more than wood studs, based on Steel Framing Alliance calculations, but metal studs offer cost advantages in other areas that can offset this price difference. Warranty callbacks are minimized because steel does not shrink, split or warp. As a result, there are no nail pops or drywall cracks to fix after the structure is completed. Consistent quality means that scrap is drastically reduced (two percent for steel versus 20 percent for wood), which also reduces costs for hauling off and disposing of discarded material. You also may enjoy significant discounts on risk insurance for steel framed structures. 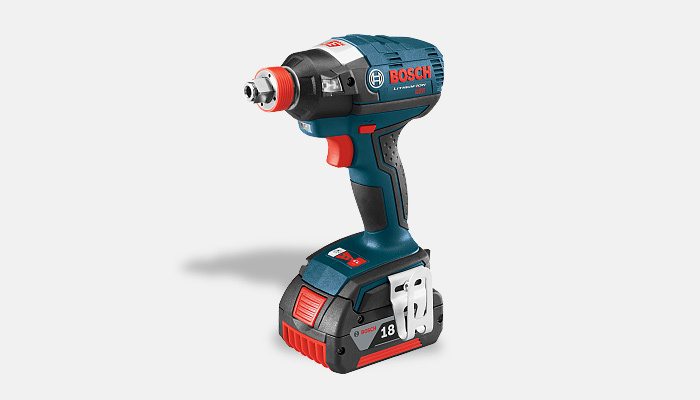 The IDH182-02L Socket Ready Bosch Impact with ¼ hex and ½ square drive is a true two-in-one tool. 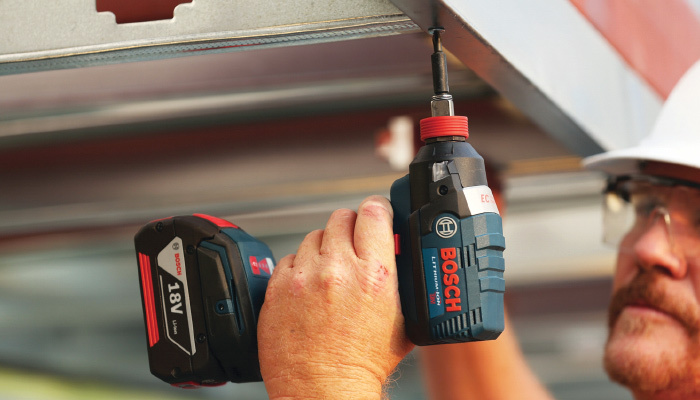 It’s both and impact driver and an impact wrench – and it’s the right tool for a metal-framing application. It allows the user to dial in the torque level for the particular job and it features a brushless motor. The impact driver/impact wrench motor is sealed to ensure tool reliability and longevity. For more information on using metal studs take a look at the Builder’s Guide to Steel Frame Construction from the Steel Framing Alliance.